(From left to right) Marzena Koziak, Alicja Kujda, Anna Kuryłowicz, and Karolina Mamczarz. Photo courtesy of Katie Decker, Esri. 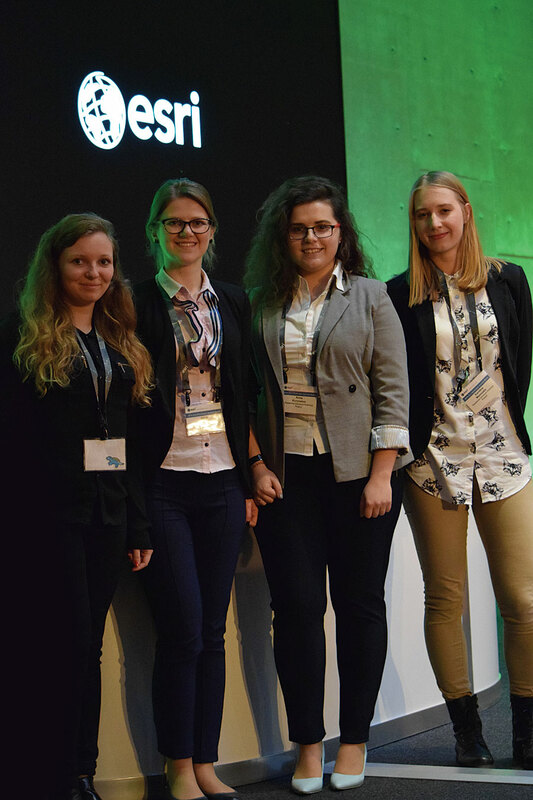 Four young developers who attended the Esri Developer Summit (DevSummit) held in Berlin, Germany, in December 2016, shared their experiences and feelings about their work in GIS and geospatial development. The four—Karolina Mamczarz, Anna Kuryłowicz, Marzena Koziak, and Alicja Kujda—recently obtained engineering degrees from AGH University of Science and Technology in Kraków, Poland, and are active members of the Dahlta Scientific Association of Surveyors. Apart from their academic work with GIS, they find that GIS helps them in daily life. They use an app to plan trips on public transit. With another app, they check air quality in Kraków. The app shows data from monitoring stations deployed throughout the city in graphs, maps, and descriptions and helps them decide if staying outside for a long time will be a good idea. The women explained their backgrounds, what drew them to GIS, why they attended the DevSummit, their areas of interest, and their plans and dreams. Karolina Mamczarz is from Rzeszów, the capital of Subcarpathian Voivodeship in southeast Poland. She graduated with an engineering degree from AGH University of Science and Technology in Kraków, Poland, and is currently a graduate student in the Mining Surveying and Environmental Engineering department specializing in geometrics. Her “adventures” in programming started when she began preparing her engineering thesis, which will focus on cartographic generalization. She most often uses Python in her work and is interested in the automation of data acquisition and processing and the creation of GIS web apps. Mamczarz was excited when she learned the Esri DevSummit would be held in Berlin, not far from where she lived. She wanted to attend not only to learn how GIS is evolving but also to present her latest project on geoprocessing solutions. She wanted the opportunity to become part of the GIS community and connect with other people who shared her development interests. Mamczarz has a passion for cartography that began when she was a child. “One of my favorite activities was to lead my finger on the maps that I had at home,” she said. In school, she participated in several orienteering competitions. Those events, combined with geography classes, made her realize how important spatial information is in daily life. When she got to the university, she learned to use ArcGIS to map environmental phenomena. “It gave me so much joy to create my own maps and later some custom geoprocessing tools,” said Mamczarz. In her free time between lectures, she works at a local company in Kraków. Her work relates to geoinformatics. She uses her skills in lidar data classification and GIS development, performing spatial analysis and automating data processing. She sees a future that will be shaped not only by opportunity but also by self-improvement. In that future, she might be a geospatial data analyst for an international company or government organization or a front-end/back end geoapps developer delivering new GIS tools to the community. “If it is my destiny, I may even start my own business with friends,” said Mamczarz. No matter what she does, she plans on using programming and project management skills that she will continue to develop. Anna Kuryłowicz, originally from central Poland, now studies and lives in Kraków. Her field of study is land surveying, and she is in a graduate program pursuing a specialization in geoinformation that focuses on photogrammetry and environmental remote sensing. Her passions are photography and old maps. Kuryłowicz believes GIS is a tremendous tool for disseminating information, and she loves interesting solutions that use GIS. That is why she decided to attend the Esri DevSummit in Berlin. She came to the summit to learn new things about GIS, and she was not disappointed. Kuryłowicz also presented her work at the summit, and the feedback she received has helped her extend her project. The first time Kuryłowicz saw a web map, she was enthralled. She traversed the world virtually for hours. She couldn’t imagine then that she would be using web maps every day. Kuryłowicz marvels that “GIS is our everyday life,” and thanks to her field of study, she can create new GIS applications that improve lives. She has been working with GIS for nearly three years. Her university studies have provided a lot of GIS training as well as many opportunities to develop related interests through participation in online courses and scientific associations. She has taken advantage of these resources since her second year in the program and participated in interesting scientific projects as well as completing additional courses. She keeps up-to-date with GIS news through reading GIS blogs and is interested in Esri conferences that let her learn about new developments in the software. She hopes to work with her friend, Marzena Koziak, on a project. With that in mind, she is learning Python and taking Esri online training seminars. “In the future, I would like to have a job, which will be my hobby,” said Kuryłowicz. She wants to work in GIS and make use of her experience in photogrammetry and remote sensing and looks forward to continually developing her skills. Marzena Koziak, also from Poland, currently lives in Kraków where she is studying geomatics at AGH University of Science and Technology. Before attending the university, she competed in volleyball. Her adventures in GIS started on GIS Day three years ago at an event organized by one of the universities in Kraków. Her areas of special interest are GIS analysis and connecting GIS with various other fields such as history. Marzena Koziak's Esri Story Maps app, The Cruel Reality, is about her project on the history of a former German Nazi Concentration Camp called Płaszów. She wanted to discover new solutions and learn about new GIS software at the Esri DevSummit in Berlin. In addition, Koziak wanted to present her project to others in the field and gather feedback from them that would help her develop the project. Her university curriculum has given her many opportunities to develop interests through online courses and scientific associations. She has participated in some interesting scientific projects and completed many additional courses. To expand her skills, Koziak is focusing this year on improving her knowledge of and proficiency with Python. She is also doing more work on a project about the history of a former German Nazi Concentration Camp called Płaszów. She created an Esri Story Maps app describing her work on this project called The Cruel Reality, which is hosted on ArcGIS Online. Looking to the future, Koziak wants to work for a company that develops innovative GIS applications in a cooperative team setting where she can focus all her attention on her work. Alicja Kujda, who lives in Kraków, is interested in GIS analysis and programming languages such as Python. She hopes to create GIS tutorials for everyone and tools for performing cartographic generalization. In her spare time, she loves cooking and swimming. For Kujda, the question was not why attend the Esri DevSummit but why not. Esri is her favorite company, and the summit was close to her home and about things that interest her. Also, she could meet people from the GIS community from all over the world and find out how GIS solutions are changing industries in other countries. 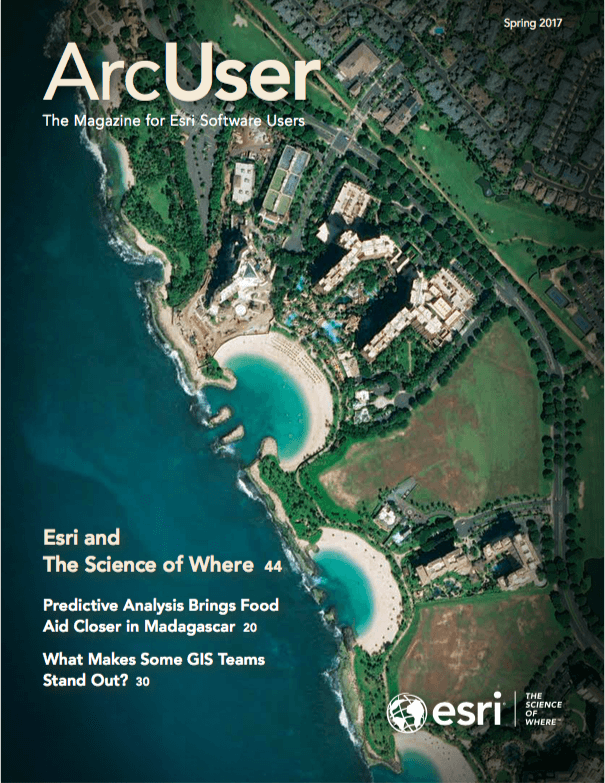 The combination of maps, analysis, and informatics technology encompassed by GIS led her to study it. Kujda cares about the things GIS does: It makes life easier, creates web maps, and serves community needs. When she was a child, she devised solutions for improving everyday processes that were often based on math. She knew she wanted to work with huge amounts of data, analyze that data, and make beautiful presentations. Her study of GIS for the past four years has been a way to learn how to do the things she has wanted to do since she was a child. She is currently a graduate student specializing in geomatics at AGH University of Science and Technology and will receive her master’s degree this year. Her thesis is focused on using Python with GIS. To prepare for this work, she is reading books from the university library and ones she finds on the Packt Publishing website. She is constantly taking new Esri online courses.